last week i ran into one of my neighbors, peg, who was determined to have her yard cleaned before she went out to california for thanksgiving. as she leaned against her push broom, her walker within a few short steps, she asked how i was doing with lil’ man, and i told her, you know, just trying to figure out motherhood. she smiled and said to me don’t you wish they had a book on what its really like to be a mother? i wanted to tell her there was and its called google, but i refrained. while i don’t think there is a clinical book out there that has accurately or honestly described the first year of motherhood, i have been thankful for the books giving me a better understanding of what is going on with baby. we as adults take everything we do, see, feel, smell, and know for granted. i guess somewhere in my mind i just assumed that babies were on their own biological timer that said hey now, its time for you to start crawling. i had not even imagined that just the ability to grasp things takes weeks of their brain growing so that it can hold all of the new data and string sequences together. instead of looking through my own lens of watching for new achievements, i have started to look through his eyes as he picks up a toy and learns to drop it. i giggle as he repeatedly does it. i get the amusement of it all now and i find myself enjoying those moments more rather than anticipating the big ones like crawling and walking. one of the books that has been shedding light on this wonderment (no pun intended) that we are both experiencing is called the wonder weeks. i am sad i missed all of the first few weeks, but am glad i can follow his journey from here on out. 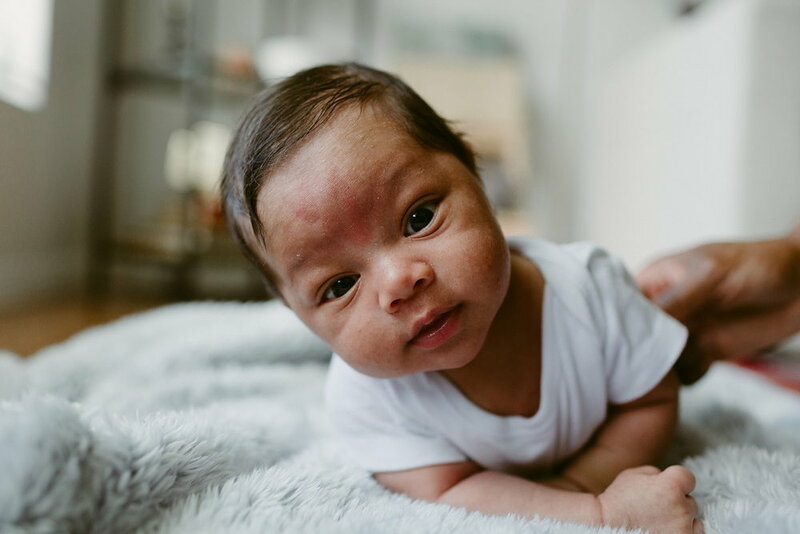 based on the book, along with the normal growth spurts, babies experience developmental leaps (the book mentions 10) that happen around certain weeks of a baby’s life. they will go through a fussy period right before the leap as their brain is trying to figure out this new “district” that has been added to their mind map. right now i am in wonder week 19 or leap 4 where he is slowly learning about cause and effect and stitching the series of events together to create the effect! this means that all the little skills he learned early are now being put together like blocks to form a new bigger and stronger skill such as sitting up and rolling. so what has lil’ man been up to? i’ll try to do a quick recap of all his milestones below and then finish off with this week. he had pretty good head control from day one and he wasn’t bad at tracking me and others either. tummy time use to be his favorite thing and he was really good at holding his head up and pushing up with his elbows. i am not sure when this was supposed to fall in the leaps but i would say he did this early. as far as talking he started babbling early although not as much as he does now. it seemed like there was a lull here. he was definitely fine tuning the skills he had already started to master. He started to like getting his diaper changed and was starting to kick and flail his arms about. he was grabbing and holding on to a few things but only when he was on his back and he wasn’t actively looking for things. he did start the teething process and has been drooling and chewing on anything and everything. i will say he did get pretty good at learning to stand up on my lap. i started noticing him noticing himself. he would wake up in the morning sometimes and just wave his arms above his head, slowly moving his fingers and wrists. definitely started talking a lot more and smiling a lot more at people. he also discovered his own reflection and is a bit infatuated with himself. has been rolling to his side for weeks but either couldn’t make the full roll or wouldn’t make the full roll. he gets pretty frustrated about it. at around 15 weeks he started insisting he sit up on my lap and even pulls himself up in the boppy if he is reclining. now he is starting to get the hang of rolling and gives me a roll (back to front) once a day now. he has been working on his core and getting better at his balance when he is sitting up. his big thing now is trying to walk and if he isn’t “walking” he wants to stand up. he is grabbing at everything now: his toes, his toes, my phone, my hair-ouch! and as i mentioned before he is starting to drop things on purpose. a few times he has even passed an object between his hands. he babbles all of the time, especially when i am trying to have a conversation with someone else. he has been doing this thing with his lips where he puckers them, lifts his chin at me, and grunts. i started tickling him the other day and he started laughing and squealing. normally he just gives me a deadpan look and may throw me a smirk, but i have never gotten him to fully react until now. there are quite a few things left on the list that he could master but if he doesn’t by the next leap then he’ll prolly master it then. i will update this on the next leap. what has your four month old been learning? Comment below!